I'm delighted to announce my musical and magical Circus Story Time is heading into the Hammersmith and Fulham area for the first time this February Half Term Holiday! I have the perfect Music Audio Story for you! 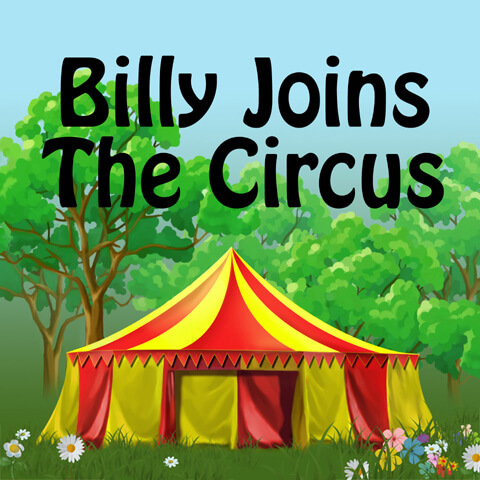 Billy Joins the Circus is a wonderfully energetic audiobook with a strong message that dreams really do come true. The catchy song with instructions on movements to make such as clapping your hands, touching your toes, spinning around and jumping up and down is repeated three times, enabling children to learn the song and the moves as they listen. Great fun and enjoyment for everyone! If you have children between the age of 2-7 years old, come and join me! Learn about the circus and be encouraged to use their listening abilities and imagination. Make drawings which will be published in a gallery on my website making them part of my creative world. Take part in my energetic story, singing and dancing along. All of my sessions are free for children and families. Join the Facebook Event Page to keep up to date with the news on these events. My unique Story Time is a mix of listening, drawing and drama. It covers a number of skills e.g: social interaction, developing self-confidence and encourages children to use their own imagination. They are fun, engaging, interactive, creative and educational. My session compliments Key Stage 1 and areas of the Early Years Foundation Stage and has been a success at schools and nurseries all over London.